Lineup - Satoko Fujii: composer, arranger, conductor; Tony Malaby, Ellery Eskelin: tenor sax; Oscar Noriega: alto sax; Andy Laster: baritone sax; Dave Ballou, Herb Robertson, Natsuki Tamura: trumpet; Joey Sellers, Joe Fiedler, Curtis Hasselbring: trombone; Nels Cline: guitar; Stomu Takeishi: electric bass; Ches Smith: drums. Creative Japanese pianist, composer, and bandleader Satoko Fujii had a particularly appealing year in terms of new music and enrichment of a prolific and audacious career marked by consistency and innovation. Following the stimulating album Aspiration, a quartet session recorded with the virtuosic trumpeters Wadada Leo Smith and Natsuki Tamura and electronics wizard Ikue Mori, the pianist focuses on a wider scenario, commanding her famous Orchestra New York, a 13-piece big band that includes some of the best improvisers and sound explorers on the scene. The work expresses feelings and sensations related to the nuclear power plant disaster of Fukushima occurred in 2011. Devised as a continuous one-hour suite, the piece was divided into five untitled parts for this record, starting with air noises that can be associated with wind blows or sea waves coming and going, intercalated with aching silences. In the periphery of this irregular hissing, we have percussive garnitures such as irregular rattles, screeches, and impulsive baritone notes surrounded by atmospheric guitar chops. It’s a slow awakening, but a powerful one. And that can be testified when the guitarist Nels Cline applies his tart chords, joining Stomu Takeishi’s electric bass plucks before a mysterious sonic mass of short cacophonous phrases and rueful cries grows in anxiety and dimension. “Track 2” is a mutable 16-minute odyssey that flourishes with the consistent drumming of Ches Smith, who roots it through the regularity of his breathable cymbal strokes. It obtains an ominous, electrifying textural persuasiveness while assorted saxophones murmur upon. A beautifully melodic moment comes to our attention when the written lines, delivered in parallel motion by the reedists, fill our ears with a magnified certitude. The saxophonists, often resorting to flutter-tonguing and other extended multi-timbre techniques, cause a great impression, operating over a malleable, thin, yet absorbing foundation built by bass, guitar, and subdued brushed drumming. This piece flutters with extraordinary dynamics and its segments are sometimes light and easygoing yet, at moments, dense and severe due to occasional collective ascendancy. Everything ends like in the beginning (with air sounds) but not before the establishment of a stylish passage where the horn section holds on a predetermined phrase laid down over a solid, tendentiously dark tapestry rooted in the rock genre. Far more reserved, “Track 3” brings us Noriega's saxophone roams with multiple ticking sounds aside, featuring trumpet wails and laments, collective warbles, and a relentless buzzing intensified by a trombone that begs for backup. He gets it by the end in another grandiose instrumentation packed with emotion and color. Before the concise heavenly contemplation of “Track 5”, the record's encouraging final piece, “Track 4” packs another great instrumental juncture that begins unhurriedly with four bass notes implying a sparse yet revelatory harmonic sequence. It scrumptiously unfolds into a groove as the baritone of Andy Laster joins the bassist, welcoming the improvisers to share something from their own. After a few indignant collective roars, the victory of human resilience arrives with the regeneration of the unyielding 5/4 groove. 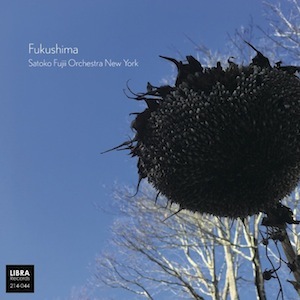 Painfully contemporary and garnished with off-kilter elements and conscientious coalescence, Fukushima is another triumph for Ms. Fujii, an insightful orchestrator.